I have had some snakes from Mesozoic without issue. Dehydration can be a factor. Shipping can be very dehydrating, and milksnakes easily dry out, especially young ones. I would keep the snake in a deli cup for awhile. Before putting it in its cup, soak it in about 1/4 inch or less (no more) of tepid water in a small container for 5 minutes or so, with one edge of the container just barely over a heat pad. This works really well to rehydrate snakes. That with nutribac usually solves issues. If it is a physical trauma, like ingested bedding, still do the above, as it cannot hurt. 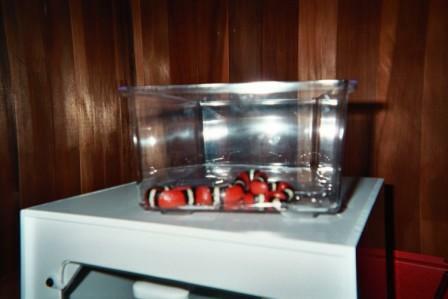 Caging for milksnakes should have little ventilation and no overhead heat lamps. There are ways to use heat lamps without dehydrating the snake, but the standard pet store way with an all-screen top is not bueno for a milksnake. Not sure how you are keeping it, just putting the info out there. Pic shows a milk soaking in like 1/8 inch of water. You can tell how hydrated she got, nice and vibrant when hydrated. When I got her, she was dull and dry.